Fans at Sooner football games can now send photos from their cell phones for display on Memorial Stadium's high-definition videoboard. 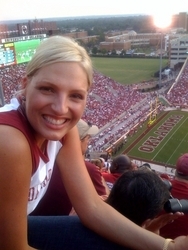 An Oklahoma Sooner fan shown in a mobile phone photo. While the Oklahoma Sooners were taking care of business against UT-Chattanooga on the football field last Saturday night, fans in attendance at Memorial Stadium were taking pictures--with their cell phones--and sending them in to be shown on the giant high-definition videoboard. That's because the University of Oklahoma and Sooner Sports Properties recently partnered with mobile sports fan network FanChatter to provide Scoreboard Photo Sharing at every Sooner home football game this season, sponsored by McDonald's. "We are extremely excited to be the first collegiate property to offer our fans and sponsors this interactive Scoreboard Photo Sharing forum that adds quality to an already fantastic game day environment at the University of Oklahoma," said Sterling Cryder, account executive at Sooner Sports Properties (a division of Learfield Sports). The move adds Oklahoma to FanChatter's expanding roster of sports and event clients. A Twin Cities-based mobile internet startup, FanChatter launched its Stadium division in March 2008 when it teamed with Major League Baseball's Minnesota Twins. The Qwest Twins Pics feature (sponsored by Qwest Communications) has since received and displayed mobile phone photos from over 7,200 unique fans through 69 straight Twins home games and counting. "After proving what we could do with the Twins, it is now an honor to help grow the game day tradition in one of college football's true capitol cities," said FanChatter co-founder Marty Wetherall. "And as we saw Saturday night, Sooner fans look as good on that hi-def videoboard as their team did in routing the (UT-Chattanooga) Mocs!" The McDonald's Sooner Football I'm Lovin' It feature invites fans to show how much they're "lovin'" the Sooners during the game by texting or emailing photos from their phone to a custom address. Every fan that sends a photo receives an instant text message reply thanking them for their submission and alerting them to special deals on McDonald's menu items. Select photos are then displayed on the videoboard before the start of the 4th quarter and all approved photos are forwarded to a McDonald's branded gallery website where they can be seen and shared with friends. The feature's reply message and branded gallery components offer added messaging platforms to advertisers while also enhancing the fans' experience between games. "FanChatter's Scoreboard Photo Sharing segment has been wildly popular and generates thousands of photos from our fans' cell phones and PDA's," said Andy Price, Director of Game Presentation and Broadcasting for the Minnesota Twins. "But what really brings this element full circle is the ability to post every photo, not just those that get selected for the videoboard in our finite time frame, into an internet scrapbook that commemorates each Twins home game." Fueled by its deals with Oklahoma and the Twins, FanChatter plans to market its services to other teams, events, and sponsors throughout the country while continuing to innovate in the area of mobile fan connectivity. "Every fan in the country should be able to see themselves on the scoreboard," said Wetherall. "And that's just the beginning of what's possible when you tap into the potential of fans and their phones." For a full description of the growing FanChatter Stadium technology offering, including video of the Scoreboard Photo Sharing feature in action, visit http://fanchatter.com/stadium . A Minnesota company, FanChatter is the joint creation of Fanacious, Inc. of Minneapolis and Slantwise Design of Hopkins. Wetherall, 35, is founder and creative director of Fanacious, Inc., a sports social networking company. He also works in advertising where his credits include the EDS Super Bowl campaign ("Cat Herders", "Airplane", and "Running With The Squirrels") and brand work for the Minnesota Twins, Minnesota Timberwolves and Minnesota Vikings. In 2003 he created THE SHOW TO BE NAMED LATER..., a "Sports Fan Reality Show" that aired first on community access television and later on Twin Cities NBC-affiliate KARE 11 in 2005. He is a graduate of the USC School of Cinematic Arts. Slantwise Design is a web design and software development studio founded in 2003 by Jonathan Dahl and Todd Emmel. The company creates usable designs and robust web applications using rapid, agile development methods. Clients range from startups to the enterprise. Most recently, Slantwise has been focused on mobile/web integration and video transcoding systems as well as Facebook and iPhone applications. Slantwise built FanChatter and FanChatter Stadium using the Ruby on Rails framework.